Positive: High scores due to creative use of natural ingredients and flavor. Negative: Similar taste can probably be achieved by adding a little Worcestershire Sauce to a giant national brand. 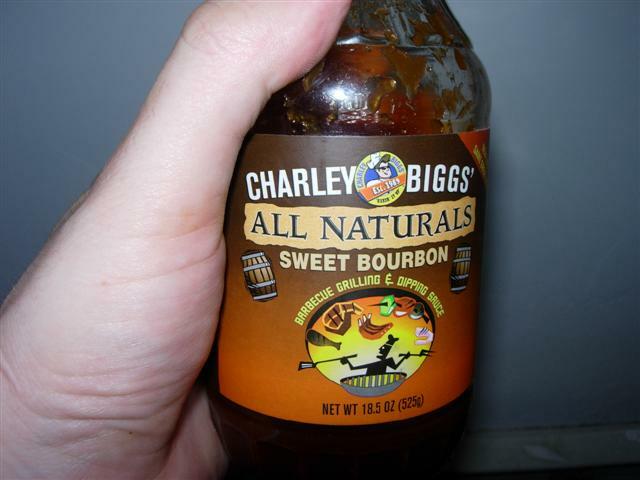 Marketed as natural, gluten-free BBQ Sauces, Charley Biggs’ has several flavors to choose from, including Hot Pepper, Sweet Bourbon, and Maine Apple, which pays respect to the Wyndham Maine birthplace of this sauce. That small town coziness has of course taken a turn, as this item was picked up at a local supermarket. The company also has franchised Chicken N’ Sauce QSRs (quick serve restaurants) so the local, small town feel is really only a history lesson. Uncooked, you could really taste what was happening in this sauce. I dipped unsalted crackers into a small pool of CB’s Sweet Bourbon so I wouldn’t throw off my taste buds with external flavors. Heavy molasses and Worcestershire Sauce and a mix of spices (garlic and onion were most dominant) really tempted the taste buds. There is no heat to this sauce, as was intended in this simple, sweet sauce. When I grilled some chicken wings with the sauce and that’s where the flavor started to get a little toned down – which was expected. It did, however make for a very satisfying BBQ meal. I see this as a nice replacement to big brand sauces made by Kraft and others. All in all, a very good value for the $3.39 I paid for an 18.5 ounce bottle. Smell: Nothing special for the olfactory senses. Smells mostly like diluted Worcestershire Sauce. Taste: A nice mild sauce for when your cooking for people with conservative taste buds. Consistency: A little thinner than expected, but higher than average marks for achieving this thickness through non-gluten techniques. Packaging: A good bottle with an open mouth means it ready to pour into an intermediary medium like a basting bowl. Ingredients: Tomato Puree, Molasses, Sugar, Cider Vinegar, Worcestershire Sauce, Sea Salt, Bourbon, Horseradish, Garlic (dry), Onion (dry), Spices.